San Tan Flat in Queen Creek is the location! You know the cameras are a scam. You’ve been watching our efforts with admiration. You may even have joined the Meetup Group, left comments on the blog and Twittered us! Now it’s time to show your support as we redouble our efforts. What’s in it for you? Well for starters, you can see the Sheriff speak live and in person, listen to some live music, have a cowboy-sized meal and meet some friendly folks. They’ll be the kind who feel the same way you do about what state politicians have hoisted on the taxpayer’s shoulders under the guise of “safety.” It’s a $25 donation per person to attend. You can sign up by donating, or just show up! Cowboy attire is optional. Scameras are prohibited! Please share your favorite moments during the Showdown at High Noon with Sheriff Babeu. This is an open forum. Bravo! They’re tattered. Some are outdated. Some aren’t bold enough and none were made just before the announcement of the Showdown At High Noon. NOTE: I’M PUTTING OUT AN APB FOR ALL OF THE OLD SIGNS… PLEASE CONTACT US IF YOU HAVE ANY. Let’s make some new signs and enjoy some food and drink at the same time. Bring something to share and some supplies. You can probably guess where it is, but if not, check the meetup. 6:30 p.m. Friday, February 5th. 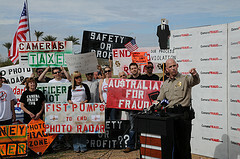 Buck Up And Support AZ Citizens Against Photo Radar! Pinal County Sheriff Paul Babeu will be the guest speaker and Michael Easterday will serve up the music as San Tan Flat Bar & Grill plays gracious hosts and have an outstanding menu so come hungry. The date is Thursday February 18th and the gates will open at 5 p.m. The festivities will begin at 6 p.m. Thank you San Tan Flat! A $25.00 donation on www.arizonacitizensagainstphotoradar.com gets your name on the guest list and $50.00 is good for two and so on. Proceeds will be used to further the public awareness campaign of the abuses and dangers of Photo Traffic Enforcement and educate about the “Ban Photo Enforcement” ballot initiative. Basically folks, we need advertising dollars. The emcee has not been announced but that will be coming very soon. Please come out to support us and have fun. After all is said and done it should be a blast and a great chance to meet some interesting and like-minded folks. Arizona is lucky to have Sheriff Paul. He was elected after promising to fight the spread of the scameras and the newest CameraFRAUD video proves that he is a man of his word. Let’s be honest, it’s very difficult for a publicly elected official to stand up against a system like Photo Traffic Enforcement when it’s a revenue generator for the state or municipality. It’s also difficult to align yourself on one side of a hot button issue, when it would be easier to pass the buck and stay neutral. That’s what makes Sheriff Paul so special. A truly valuable public figure and law enforcement official is supposed to work for the people. He stands up for what’s right when so many bow down in the interest of profit over safety. 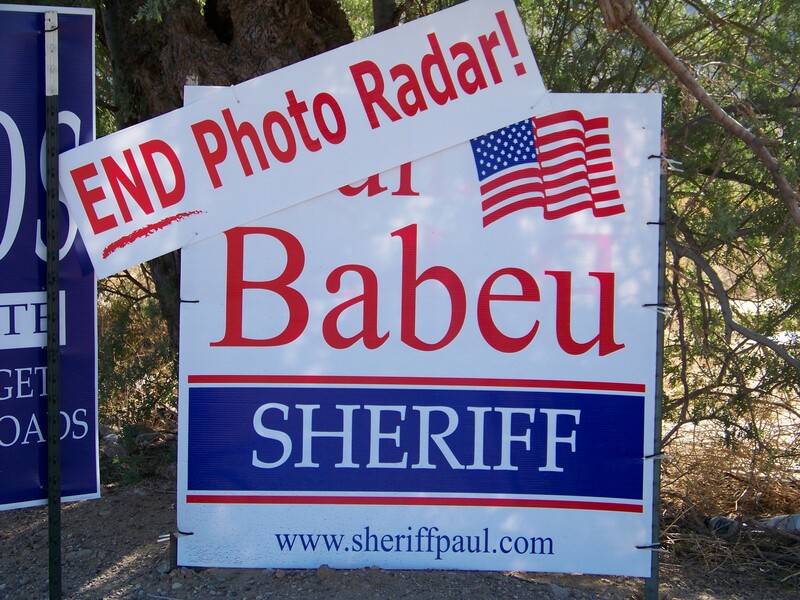 Arizona Citizens Against Photo Radar will be holding a fundraiser dinner with Sheriff Paul on February 18th. Check back for more details as they come. A local business has also offered to donate a percentage of every sale they make to the cause as well. See their ad below. Thanks to the voters of Pinal County for choosing so wisely. Thanks to Sheriff Paul for supporting our cause. The Cameras Are Coming Down! Here’s to 2010 being the year the cameras come down! But first CameraFRAUD would like to take one last look at what made 2009 a tremendous year for news in photo enforcement. Enjoy! 1. 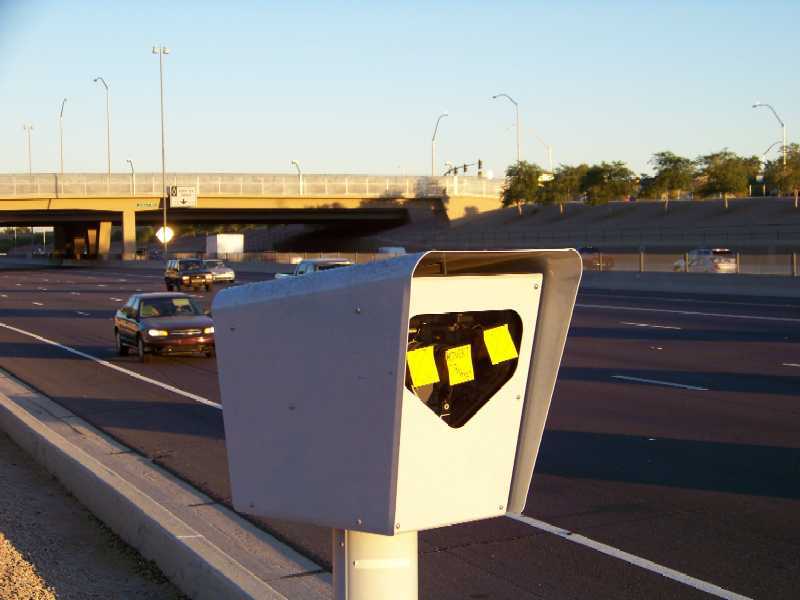 Trash Your Tickets – In December of 2008, The New Times published an article letting Arizona Motorists know that they can legitimately ignore their photo radar tickets, without any repercussions. Of course, if a process server finds you, there’s an obligation to reply. The idea of ignoring tickets was repeated throughout 2009 and soon the entire system became overwhelmed with unpaid tickets. DPS, Redflex and ATS have no solution to this self imposed problem other than to issue more tickets and increase fines. Bravo! 2. Ban Photo Radar in AZ Initiative – In January, CameraFRAUD held a press conference at the State Capitol to announce the Initiative to Ban Photo Radar Statewide. Pinal County Sheriff Paul Babeu was present and the first to sign. 153,000+ validated signatures are needed to put the initiative to a vote in November of 2010. The deadline to turn them in is July 2010 and we are well on our way. 3. 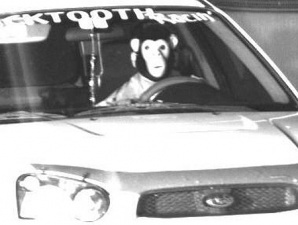 Monk ey Mask Motorist – Some may call him a scofflaw and others call him a brave dissenter. Whatever your judgment of the man is, he certainly captured the attention of DPS, Local Media and a public outraged by the photo radar scameras. His case is still pending but it’s clear that the Arizona Department of Public Safety wants to make an example out of him. They approached the flight attendant while he was at work with 37 civil traffic violations caught on camera. He maintains that he will not pay because there is no proof in any of the photos that he is the driver. 4. 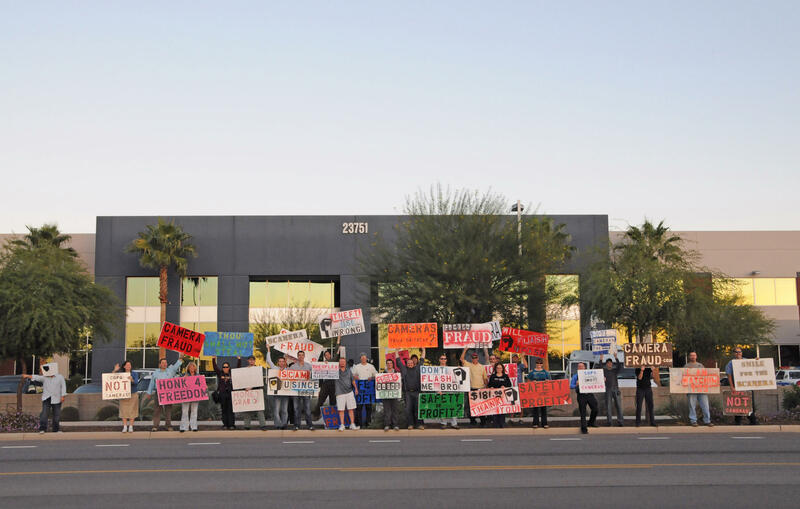 Sheriff Babeu Bans Photo Radar in Pinal County, Terminates Redflex Contract – In January, P inal County Sheriff Paul Babeu presented the County Board of Supervisors with his reasons for terminating the contract with Redflex and ending the program. This fulfilled Sheriff Paul’s campaign promise to rid his county of the scamera system. If only other elected officials were as true to their word as him! 5. Redflex Driver Shot and Killed inside van – While on duty in April, Redflex Van Operator Doug Georgianni was fatally shot from a passing vehicle on the 101 Freeway near 7th Avenue. The shooter was quickly apprehended by a DPS officer. He had apparently acted alone. The tragedy was later politicized by DPS Lt. James Warriner who stated that vocal criticism of Redflex had led to the murder. 6. 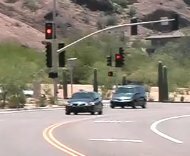 Paradise Valley Ticket Fraud – In June, one of our volunteers realized that Paradise Valley had illegally shortened yellow light times at the intersection of Tatum and McDonald in an effort to create more violations to drum up revenue. After the city was called numerous times about the short yellow times, they were forced to admit that 1,063 tickets were issued illegally. The tickets were either canceled or refunded if they had been paid. This would have represented almost $200,000 in revenue to the city. 7. 3,600 Tickets Same Day Same Court – Our volunteers were tipped off, local media was alerted and the circus ensued. By a scheduling gaffe of epic proportions, 3,600 photo radar tickets were assigned to the same down town Phoenix Civil Court for the same day at the same time. Obviously logistics and simple physics would not allow for that many people to be herded through our court system like sweaty cattle in the July heat. Somewhat predictably, the number of people who actually showed was dramatically less than 3,600, but a gigantic line of those who did formed. 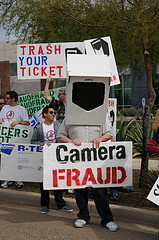 CameraFRAUD volunteers were on site to capture the moment and collect signatures for the initiative. After all was said and done, about 100 people who were scheduled to appear in court actually showed. 8. State Legislature Fails To Ban Photo Radar – Many proposals and bills to ban photo enforcement and end the statewide freeway contract with Redflex, but they all died for one reason or another. Representative Sam Crump, Republican from Anthem was the most vocal and active opponent of the program but his efforts alone weren”t enough. Our elected officials proved that they are more concerned with filling the state’s coffers than about safety or the public good. 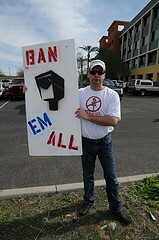 It is more and more apparent that it will be up to the citizens of Arizona to impose the ban. 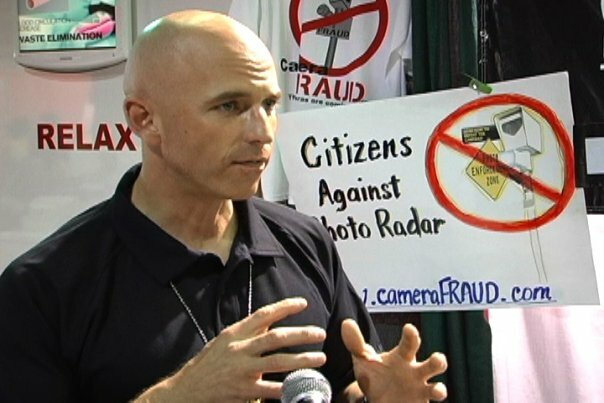 November 2nd, 2010 could be the day that happens, if CameraFRAUD and Arizona Citizens Against Photo Radar are successful in their public awareness and political activist campaigns. 9. CameraFRAUD vs Redflex Debate – In November, Shawn Dow squared off with Jay Heiler, Director of Government Affairs with Redflex, in a debate over photo enforcement hosted by the Tempe Chamber of Commerce. Heiler was the infamous Chief of Staff for Fife Symington while he was governor of Arizona. 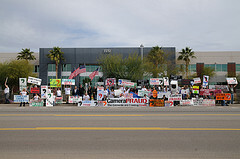 This was the first time that there was a sanctioned event pitting the scamera company with the volunteer organization. Both sides presented their arguments clearly but it was apparent from the beginning that Heiler was determined to poison the debate with his manipulative brand of corporate rhetoric and attack Shawn’s enthusiasm. Score the debate for the good guys. Sheriff Paul Babeu of Pinal County takes on the issue of photo enforcement with KJZZ’s Steve Goldstein.